Why would you buy the same windows that have failed you before? Are you building a new home, or replacing your current windows and thinking of upgrading? ​Let us tell you about our Windows, which are great for new projects and window replacements. Tilt/turn widows are a standard German system of windows, used in new buildings and in renovations of older buildings. Our Platinum Star windows and doors use German A-class Rehau Brilliant profiles, while we have Aluplast profile options for renovations/window replacements. Siegenia/Winkhaus hardware is responsible for the Tilt and Turn functions of the windows, ensuring maximum durability, efficiency and functionality. All these fancy words boil down to the basics, we have a very high quality product. These windows are EXTREMELY durable, very efficient at keeping cold air, sound and any unwanted outside elements out, while keeping your house warm and secure. The inward tilt function of our windows offers great ventilation for any space, while still offering protection from outside elements like the wind and rain. When closed, our sashes use compression, not friction, to keep the entire window airtight, ensuring maximum thermal & acoustic efficiency. The micro-ventilation feature offers even more versatility to our windows, when in the micro-ventilation position, air flow will be greatly reduced, allowing for air ventilation in extreme temperatures. 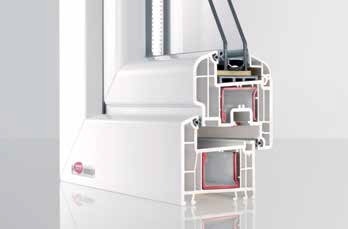 The inward opening action adds great functionality to our windows. Most importantly, this function creates an effective egress window*, allowing safe and quick escape in case of emergency. Also, it allows for safe cleaning of both sides of the window, from inside of the house. These make the windows a beautiful addition to any building. ​- Many locking point and steel running through the entire frame: Our products are designed to last & never need a replacement ( click here to watch a break-in attempt on a Tilt/Turn window ). The locking points and our rubber seals work together to create an airtight seal. Resulting in great water, air, and sound deflection. - Triple glazing ( Triple pane) and lamination's available Our products block sun, air and noise very efficiently (check out This Video of how well our windows block sound). With optional triple pane laminated glass and Low-e coating our windows can withstand ANY climate. Just like our Tilt and Turn windows, our picture windows are made from the same selection of high-quality profiles. This means they are identical to our Tilt turn windows, apart from the fact that they have no moving hardware. They share the same thermal and acoustic benefits. They can be built alongside our Tilt and Turn windows and even our doors in almost any sensible configuration! A steel reinforcement running throughout the entire frame/sash and maximum allowable amount of locking points on each product ensures durability and security. In a triple-pane glass product, there is enough room between every piece of glass to ensure that there is minimal temperature transference. This is made possible by the 70 mm profile. Our profile is compatible with Sigienia and Winkhaus hardware, which is responsible for all the operations ( closing, opening and tilting ) of the window. This allows for extremely smooth operation. Unlike many windows, our profile utilizes compression of rubber seals to close. This ensures air tightness of our products when closed. Our Aluplast profiles are great options for renovations. Our 4000 series can have a smaller and modern look, while our 8000 series has the best thermal properties we have to offer. Tried and tested burglar resistance. 85 mm profile depth, an optional Uw value of 0.67, 48 DB of sound protection and unparalleled security makes this the top of the line profile able to withstand almost anything. With hundreds of colour options, we are sure to have a perfect colour for you! Basement Egress Windows ​Have any questions on our egress windows? click Here or contact us! New Construction Windows Have any questions on how to get our windows into your new home? Click here or Contact us!